This is “Japan and Korea (North and South)”, section 10.4 from the book Regional Geography of the World: Globalization, People, and Places (v. 1.0). For details on it (including licensing), click here. Summarize the physical geography of the Korean peninsula. Understand how North Korea and South Korea developed independently. Outline the political structure of North Korea. Describe how South Korea developed a high standard of living and a prosperous economy. Express how the concept of regional complementarity can apply to the Koreas. Japan consists of islands that lie along the Pacific Rim east of China and across the Sea of Japan from the Korean Peninsula. Most of the archipelago, which has more than three thousand islands, is just north of 30° latitude. Four islands make up most of the country: Shikoku, Kyushu, Hokkaido, and Honshu. The islands have tall mountains originating from volcanic activity. Many of the volcanoes are active, including the famous Mount Fuji. 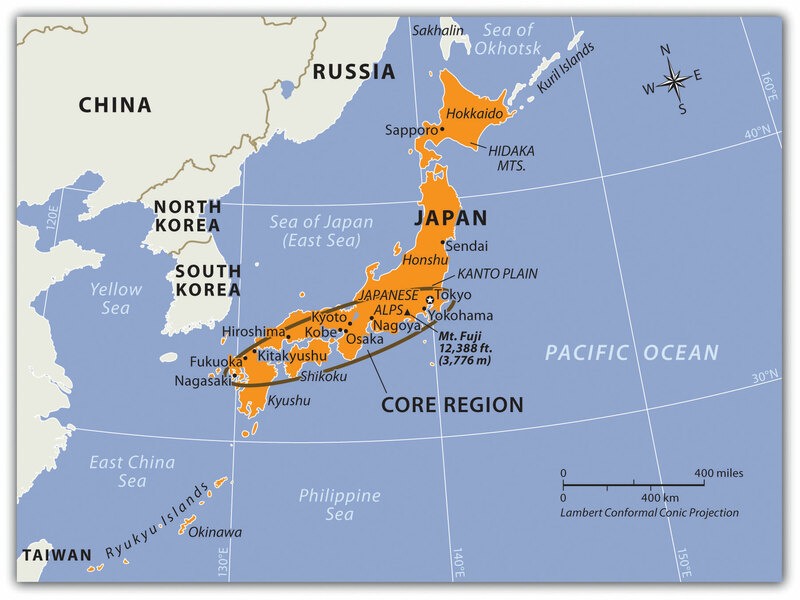 The physical area of all Japan’s islands is equivalent to about the size of the US state of Montana. The mountainous islands of Japan extend into two climate zones. All but the northern region of Japan has a type C climate. The island of Hokkaido in northern Japan has a type D climate and receives enough snow for downhill skiing. Japan hosted the Winter Olympics in 1998. Mt. Fuji, located just west of Tokyo, is a widely photographed mountain because of its symmetrical volcanic cone. Cities like Mexico City, São Paulo, and Bombay, which have vast slum communities, each claims to be the world’s largest city but lacks firm census data to verify its population. The largest metropolitan urban area in the world that can be verified is Tokyo, with a population of 26.7 million. The Tokyo metropolitan area is located in an extensive agricultural region called the Kanto Plain and includes the conurbation of Tokyo, Yokohama, and Kawasaki. The second-largest urban area in Japan is located in the Kansai District, and includes the cities of Kobe, Osaka, and Kyoto. 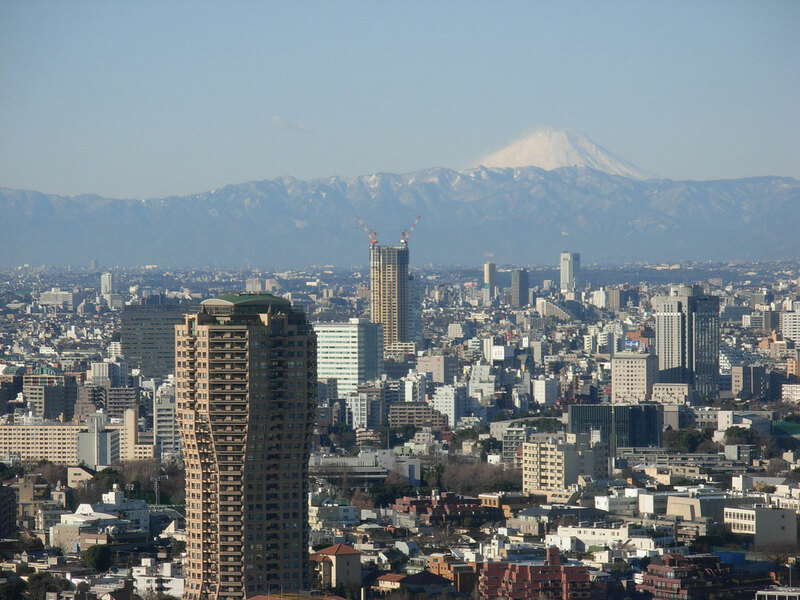 Japan is a mountainous region, and most of its large cities are located in low-lying areas along the coast. Most of the population (67 percent) lives in urban areas such as Japan’s core area, an urbanized region from Tokyo to Nagasaki. The 2010 population of Japan was listed at about 126 million, less than half the size of the United States. It is ironic that the world’s largest metropolitan area is built on one of the worst places imaginable to build a city. Tokyo is located where three tectonic plates meet: the Eurasian Plate, the Philippine Plate, and the Pacific Plate. Earthquakes result when these plates shift, leading to possibly extensive damage and destruction. In 1923, a large earthquake struck the Tokyo area and killed an estimated 143,000 people. In 1995, an earthquake near Kobe killed about 5,500 people and injured another 26,000. Source: Photo courtesy of paper balloon, http://www.flickr.com/photos/bonjourmeeshell/3201391144. In March 2011, a magnitude 9.0 earthquake struck forty-three miles off the eastern coast of northern Japan. The earthquake itself caused extensive damage to the island of Honshu. A shockwave after the earthquake created a tsunami more than 130 feet high that crashed into the eastern coast of Japan causing enormous damage to infrastructure and loss of life. Hundreds of aftershocks were recorded; at least three registered over 7.0 in magnitude. This is the strongest earthquake to ever hit Japan in recorded history. It resulted in more than 15,500 deaths and wreaked serious damage across Japan in the value of billions of dollars. Thousands of additional people remain missing. Nuclear power plants along the coast were hit hard by the tsunami, which knocked out their cooling systems and resulted in the meltdown of at least three reactors. The nuclear meltdowns created explosions that released a sizeable quantity of nuclear material into the atmosphere. This is considered the worst nuclear accident since the 1986 reactor meltdown at the Soviet plant at Chernobyl, located north of Kiev in present-day Ukraine. The next big earthquake could happen at any time, since Japan is located in an active tectonic plate zone. The country of Japan is an interesting study in isolation geography and economic development. For centuries, shogun lords and samurai warriors ruled Japan, and Japan’s society was highly organized and structured. Urban centers were well planned, and skilled artisans developed methods of creating high-grade metal products. While agriculture was always important, Japan always existed as a semiurban community because the mountainous terrain forced most of the population to live along the country’s coasts. Without a large rural population to begin with, Japan never really experienced the rural-to-urban shift common in the rest of the world. Coastal fishing, always a prominent economic activity, remains so today. The capital city of Tokyo was formerly called Edo and was a major city even before the colonial era. Japan developed its own unique type of urbanized cultural heritage. Encounters with European colonial ships prompted Japan to industrialize. For the most part, the Japanese kept the Europeans out and only traded with select ships that were allowed to approach the shores. The fact that European ships were there at all was enough to convince the Japanese to evaluate their position in the world. During the colonial era, Britain was the most avid colonizer with the largest and best-equipped navy on the high seas. Britain colonized parts of the Americas, the Middle East, Africa, South Asia, and Australia and was advancing in East Asia when they encountered the Japanese. Both Japan and Great Britain are island countries. Japan reasoned that if Great Britain could become so powerful, they should also have the potential to become powerful. Japan encompassed a number of islands and had more land area than Britain, but Japan did not have the coal and iron ore reserves that Britain had. Around 1868, a group of reformers worked to bring about a change in direction for Japan. Named after the emperor, the movement was called the Meiji RestorationThe return of enlightened rule, starting in 1868 when modernizers took control of Japan. (the return of enlightened rule). 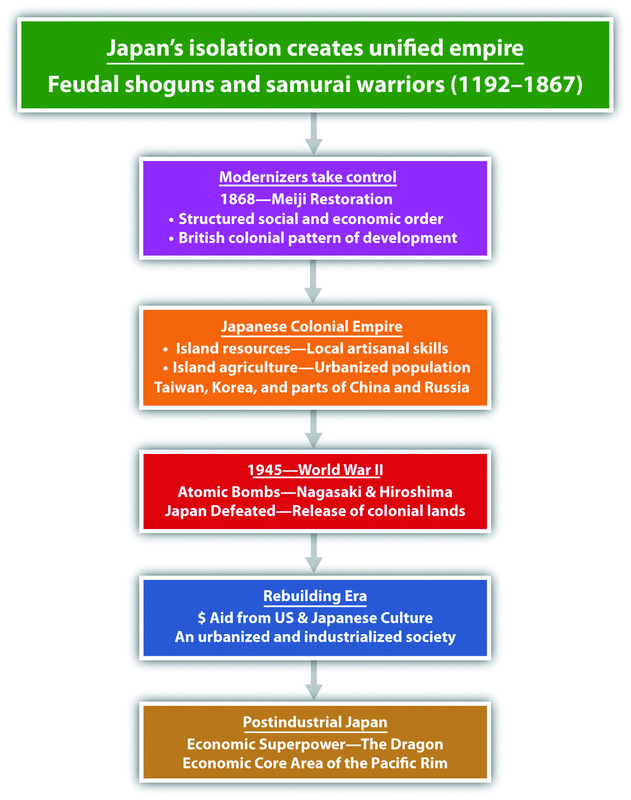 Japanese modernizers studied the British pattern of development. The Japanese reformers were advised by the British about how to organize their industries and how to lay out transportation and delivery systems. Today, the British influence in Japan is easily seen in that both Japanese and British drivers drive on the left side of the road. The modernizers realized that to compete on the high seas in the world community they had to move beyond samurai swords and wooden ships. Iron ore and coal would have to become the goods to fuel their own industrial revolution. Labor and resources were valuable elements of early industrialization in all areas of the world, including Asia. 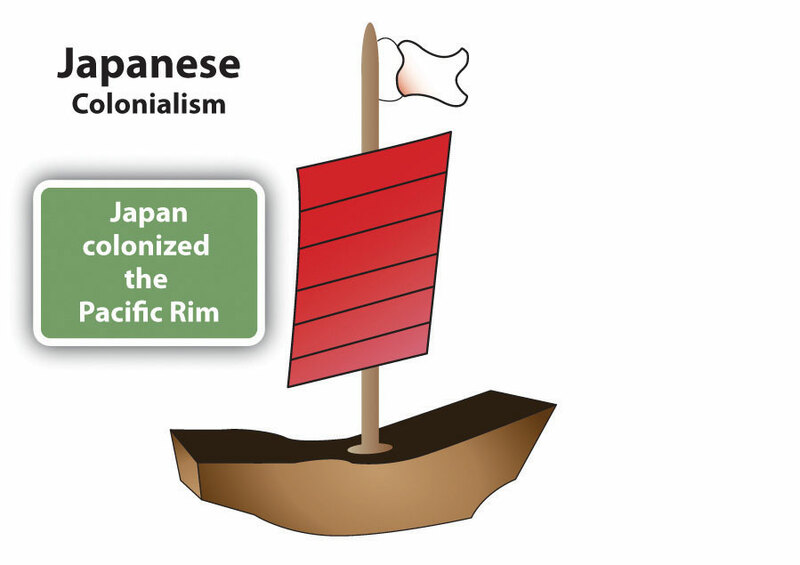 Japan was a major colonial power in the Asian Pacific Rim. Japan colonized parts of Russia, China, Taiwan, Philippines, Southeast Asia, and Korea. Japan began to industrialize and build its economic and military power by first utilizing the few resources found in Japan. Since it was already semiurban and had an organized social order with skilled artisan traditions, the road to industrialization moved quickly. Japan needed raw materials and expanded to take over the island of Formosa (Taiwan) and the Korean Peninsula in the late nineteenth and early twentieth centuries. Japan was on its way to becoming a colonial power in its own right. They expanded to take control of the southern part of Sakhalin Island from Russia and part of Manchuria (Northeast China) from the Chinese. Japanese industries grew quickly as they put the local people they subjugated to work and extracted the raw materials they needed from their newly taken colonies. 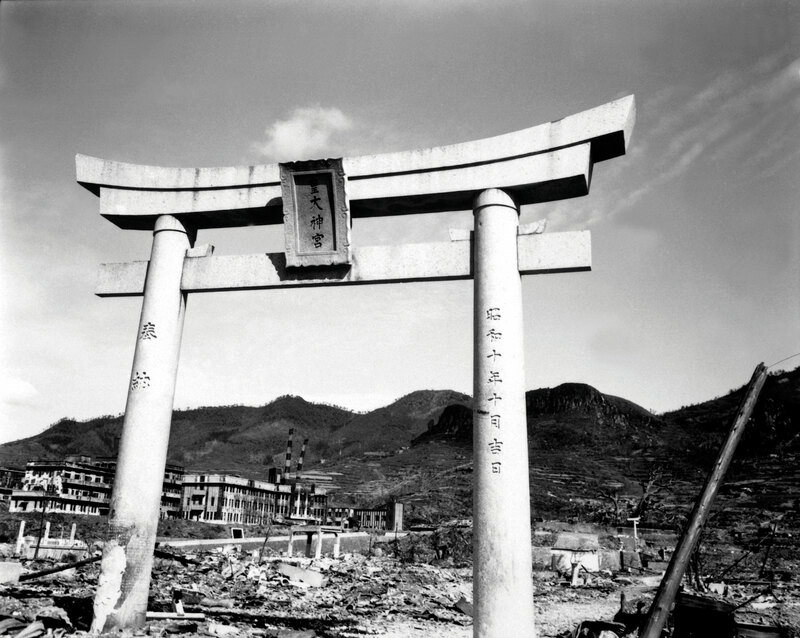 This photo, taken after the atomic bomb blast of World War II in 1945, illustrates all that was left standing of a Shinto shrine in Nagasaki. Source: Photo courtesy of the US Marine Corps, taken by Lt. R.J. Battersby. The three-way split in China revealed that the Japanese colonizers were a major force in China even after the other European powers had halted their colonial activities. Japan’s relative location as an independent island country provided both quick access to their neighbors and also protection from them. By World War II, Japan’s economic and military power had expanded until they were dominating Asia’s Pacific Rim community. The Japanese military believed that they could invade the western coast of North America and eventually take control of the entire United States. Their attack on Pearl Harbor, Hawaii, in 1941, was meant to be only a beginning. History has recorded the outcome. The United States rallied its people and resources to fight against the Japanese in World War II. The Soviet Union also turned to fight the Japanese empire. The end came after atomic bombs, one each, were dropped by the United States on the Japanese cities of Hiroshima and Nagasaki. The terms of Japan’s surrender in 1945 stipulated that Japan had to give up claims on the Russian islands, Korea, Taiwan, China, and all the other places that they had previously controlled. Japan also lost the Kurile Islands—off its northern shores—to the Soviet Union. The islands have never been returned. Japan offered Russia an enormous amount of cash for them but the matter remains unresolved. The Kurile Island chain continues to be controlled by Russia. Japan also agreed not to have a military for offensive purposes. Japan was decimated during World War II, its infrastructure and economy destroyed. Since 1945, Japan has risen to become Asia’s economic superpower and the economic center of one of the three core areas of the world. Japanese manufacturing has set a standard for global production. For example, think of all the automobiles that are Japanese products: Toyota, Honda, Mitsubishi, Subaru, Nissan, Isuzu, Mazda, and Suzuki. How many Russian, Brazilian, Chinese, or Indonesian autos are sold in the United States? The term “economic tiger” is used in Asia to indicate an entity with an aggressive and fast-growing economy. Japan has surpassed this benchmark and is called the economic dragonEconomic superpower in Asia—often used to refer to Japan. of Asia. The four economic tigers competing with Japan are Singapore, Hong Kong, Taiwan, and South Korea. Japan came back from total devastation in 1945 to become a world economic superpower. Japan’s recovery in the last half of the century was remarkable. If an island nation like Japan could accomplish this rapid growth in its economy, why couldn’t other similar-sized countries accomplish the same level of growth? What was it that caused the Japanese people to not only recover so quickly but rise above the world’s standard to excel in their economic endeavors? The answer could be related to the fact that Japan already had an industrialized and urbanized society before the war. The United States did help rebuild some of Japan’s infrastructure that had been destroyed during World War II—things like ports and transportation systems to help bring aid and provide for humanitarian support. However, the Japanese people were able to not only recover from the devastation of World War II but rise to the level of an economic superpower to compete with the United States. Japan used internal organization and strong centripetal dynamics to create a highly functional and cohesive society that focused its drive and fortitude on creating a manufacturing sector that catapulted the country’s economy from devastation to financial success. The same dynamics can be applied to Germany after World War II. Germany was completely destroyed by the war. The Allied powers decimated Germany’s infrastructure and resources. Today, Germany is the strongest economy in all of Europe. Part of the reason Germany came back to become so economically successful was its industrialized and urbanized society. Germany also was able to access resources. Again, think of all the automobiles that are German products: Mercedes, Volkswagen, Porsche, BMW, and Audi. The pattern of economic growth was similar for Germany and Japan. The loss of colonies after World War II prompted Japan to look elsewhere for its raw materials. Extensive networks of trade were developed to provide the necessary materials for the rapidly growing manufacturing sector. The urbanized region around Tokyo, including the cities of Yokohama and Kawasaki, swelled to accommodate the growth of industry. Japan’s coastal interior has a number of large cities and urban areas that rapidly increased with the growing manufacturing sector. The basis for Japan’s technological and economic development may be related to its geographic location and cultural development. Japan’s pattern of economic development has similarities to the patterns of other Asian entities that have created thriving economic conditions. Hong Kong and Taiwan are both small islands with few natural resources, yet they have become economic tigers. Taiwan exports computer products to the United States, but Russia, with all its natural resources, millions of people, and large land area, does not. Explaining how or why countries develop at different rates can be complex, because there may be many interrelated explanations or reasons. 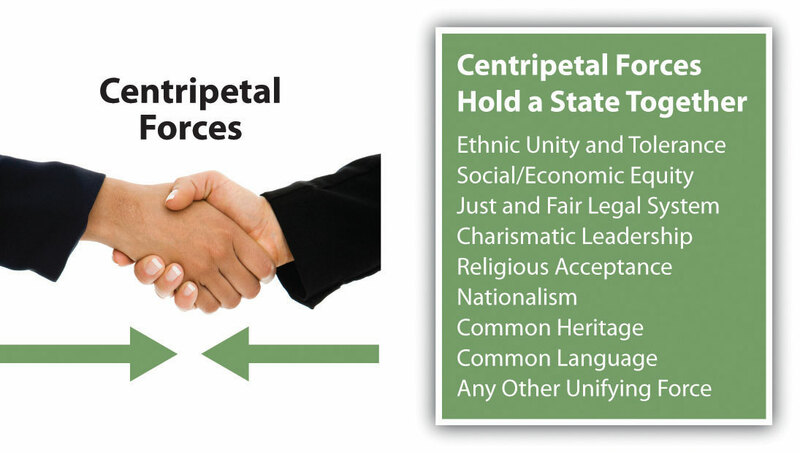 One element might be centripetal cultural forces that hold a country together and drive it forward. The ability to manage labor and resources would be another part of the economic situation. The theory of how countries gain wealth may shed some light on this issue. Japan used manufacturing as a major means of gaining wealth from value-added profits. This is the same method the Asian economic tigers also developed their economies. Japan developed itself into a core economic country that took advantage of the peripheral countries for labor and resources during the colonial era. Japan took advantage of every opportunity that presented itself to become a world manufacturing center. Japan is a homogeneous society. In 2010, all but 1 percent of the population was ethnically Japanese. Japan resembles a nation-state, where people of a common heritage and aspirations hold to a unified government. This provides a strong centripetal force that unites the people under one culture and one language. However, religious allegiances in Japan vary, and there are a good number of people who indicate nonreligious ideologies. ShintoismEthnic religion that is indigenous to Japan. and Buddhism are the main religious traditions. Shintoism includes a veneration of ancestors and the divine forces of nature. There is no one single written text for Shintoism; the religion is a loosely knit set of concepts based on morality, attitude, sensibility, and right practice. It is possible for a Shinto priest to conduct a wedding for a couple, whereas the funeral (hopefully taking place much later) for either of the spouses might be conducted by a Buddhist priest. The Buddhism that is practiced in Japan is more meditative in nature than mystical. Modernization has brought new opportunities and problems for the Japanese people. With a highly urban and industrial society, personal incomes in Japan are high and family size is quite low, at about 1.2 children. The replacement level for a given population is about 2.1 children, which means Japan has a declining population. The population is aging and there are not enough young people to take entry-level jobs. The family has been at the center of Japanese tradition, and the elderly have been venerated and honored. As the country has become more economically developed, higher incomes for young people have prompted a shift toward convenience and consumer amenities. Consumer goods are available, but all the oil and about 60 percent of the food products have to be imported. During the off season, fruit, for example, is expensive. Beef is at a premium price, so fish is a staple source of protein. Income levels are high, but the cost of living in places like Tokyo is also quite high. Japan is facing a labor shortage for many low-level service jobs that had traditionally been held by young people entering the workforce. Japan is an island country that has prided itself in being 99 percent Japanese. Countries in stage 5 of the index of economic development usually enter a negative population growth pattern. According to population statistics, Japan is at the start of a serious population decline, with a negative population growth pattern. While Western Europe and the United States also have a declining percentage of young people, in those countries the declining youth cohort has been replaced by an elevated level of immigration, both legal and illegal. Culturally, this is not an attractive option for Japan, but they are forced to address the labor shortage in any way they can. Their economy will depend on the ability to acquire cheap labor and resources to compete in the global marketplace. What cultural centripetal forces have been holding Japan together? As the economic dragon of Asia, Japan has had an enormous economic impact on the East Asian Community (EAC). The shortage of cheap labor has forced Japan to look elsewhere for new manufacturing ventures. China is an attractive country in this respect because of its substantial population and low standard of living for many of its citizens. Japan is looking to take advantage of its geographical location to establish a more positive trade situation with its Asian neighbors. The dynamics of its economy are uniquely similar to that of the United States and Europe. All three core economic areas are competing for inexpensive labor and resources to fuel their economies. China has been a major destination for manufacturing production because of its low labor costs and attractive financial incentives. If you recall, during World War II China and Japan were locked in a bitter war that caused harsh animosities to take root against each other. The two countries have not historically been friendly toward each other. Japan’s history as a colonizer has caused serious cultural attitudes against it from its Asian neighbors. Nevertheless, economics usually drive politics, and Japan wields enormous economic power. Japan now engages in trade with China and continues to be a core economic country in the global economy. The Korean Peninsula juts out into the Pacific Rim from northwestern Asia. The peninsula is bound by the Sea of Japan (the East Sea) and the Yellow Sea. North and South Korea share the peninsula. These countries have been separated by the Korean demilitarized zone (DMZ) since 1953. To the west and north is China and to the far north along the coast is Russia. Korea is separated from China by the Yellow Sea and the Yalu and Tumen Rivers to the north. The Yalu and Tumen rivers form the actual border between North Korea and China. Japan is located just east of the Korean Peninsula across the Korea Strait. The Korean Peninsula is now split between South Korea and North Korea. 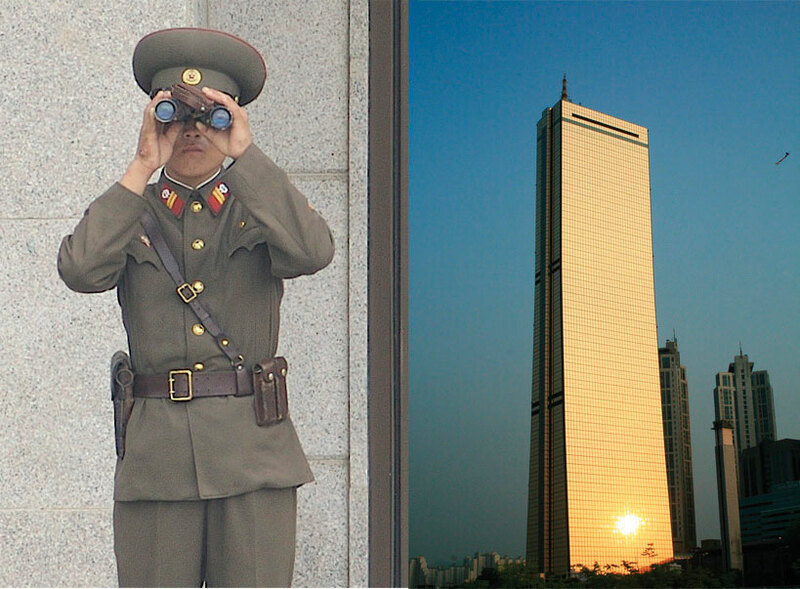 The capital city of North Korea is Pyongyang, and Seoul is the capital of South Korea. Off the southern and western coasts of the Korean Peninsula are about three thousand small and mostly uninhabited islands, all within the territory of South Korea. South Korea’s largest island has an area of 712 square miles. It is the highest point of land in South Korea, at 6,398 feet above sea level. North and South Korea have very different, yet related, environmental issues, primarily related to the degree of industrialization. With a low level of industrialism, North Korea has severe issues of water pollution as well as deforestation and related soil erosion and degradation. Other issues in North Korea include inadequate supplies of clean drinking water and many waterborne diseases. South Korea has water pollution associated with sewage discharge and industrial effluent from its many industrial centers. Air pollution is severe at times in the larger cities, which also contributes to higher levels of acid rain. The physical size in square miles of North Korea or South Korea is similar to the physical area of the US state of Kentucky. North Korea is slightly larger, and South Korea is slightly smaller. For centuries, Korea was a unified kingdom that was often invaded by outsiders. After the fall of the Chinese Qing (Manchu) Dynasty, the Japanese took control of the Korean Peninsula (1910) and controlled it as a colony. Japanese colonial rule ended in 1945 when the United States defeated Japan, forcing it to give up its colonial possessions. The structure of modern Korea is a result of the ending of World War II. The thirty-eighth parallel cuts across the peninsula in the area of the DMZ farmland. The thirty-eighth parallel on or near the DMZ is the Cease-Fire Line between North and South Korea (right). Sources: Photo courtesy of US Information Agency, http://research.archives.gov/accesswebapp/faces/showDetail?file=Item_541822.xml&loc=108. The conclusion of World War II was a critical period for the Korean Peninsula. The United States and the Soviet Union both fought against the Japanese in Korea. When the war was over, the Soviet Union took administrative control of the peninsula north of the thirty-eighth parallel, and the United States established administrative control over the area south of the thirty-eighth parallel. The United States and the Soviet Union divided Korea approximately in half and eventually established governments in their respective regions that were sympathetic to each nation’s own ideology. The Soviet Union administered the northern portion; the United States administered the southern region. Politics deeply affected each of the regions. Communism dominated North Korea and capitalism dominated South Korea. In 1950, with aid from China and the Soviet Union, the Communists from the north invaded the south. After bitter fighting, a peace agreement was reached in 1953 to officially divide the Korean Peninsula near the thirty-eighth parallel. Korea remains divided to this day. The United States has thousands of soldiers stationed along the Cease-Fire LineDemilitarized zone dividing North and South Korea. (or DMZ), which is the most heavily guarded border in the world. The government of North Korea (Democratic People’s Republic of Korea, or DPRK) was formed with the leadership of Communist dictator Kim Il Sung, who shaped his country with a mix of Soviet and Chinese authoritarian rule. Having few personal freedoms, the people worked hard to rebuild a state. Using the threat of a US military invasion as a means of rallying his people, Kim Il Sung built up a military of more than one million soldiers, one of the largest in the world. People could not travel in or out of the country without strict regulation. North Korea existed without much notice until the 1990s, when things suddenly changed. When the Soviet Union fell in 1991, North Korea lost a valued source of financial support and oil. Without fuel and funding, many of the factories closed. Unemployment rates rose significantly. Meanwhile, China adopted a more open posture and began to increase its level of trade with the West. The result was that China began to lose interest in propping up North Korea politically. North Korea was facing serious problems. Massive food shortages caused famine and starvation. Thousands of people died. Kim Il Sung died in 1994 and the country lost their “Great Leader.” He had ruled the country since World War II and in the end was deified as a god to be worshiped by the people. 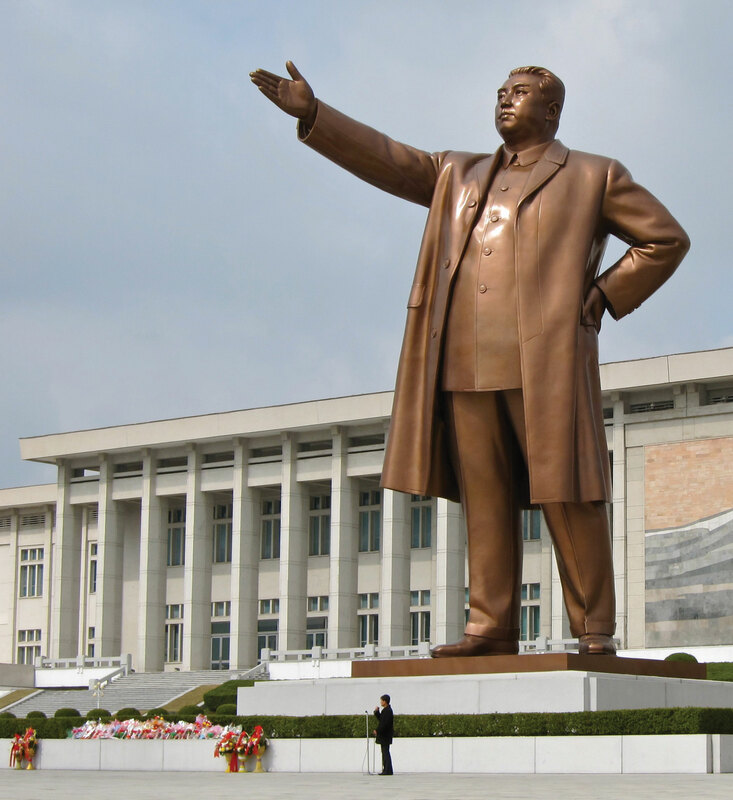 This giant statue of North Korea’s “Great Leader” Kim Il Sung stands in the capital city of Pyongyang and is called the Mansudae Grand Monument. This mammoth bronze statue was built in 1972 to celebrate the Great Leader’s sixtieth birthday. Source: Photo courtesy of John Pavelka, http://www.flickr.com/photos/28705377@N04/4610364189. The government dictatorship continued as the Great Leader’s son, Kim Jong Il, took over the leadership role. Kim Jong Il, known as the “Dear Leader,” took repression of his people to new levels. Televisions and radios sold in North Korea can only receive government-controlled frequencies. Cell phones and the Internet are banned. The government takes a hard line against dissenters. If you are caught speaking against the state or taking any action to support dissent, you can be arrested, fined, placed in a prison camp, or executed. People are not allowed to leave or enter the country without government approval. Only a couple hundred tourists are allowed into the country per year and are closely escorted. Kim Jong Il has taken hard measures to stay in power and to avoid yielding to the capitalist frenzy of corporate colonialism. He has nuclear weapon capability and has used his military weapons production as a bargaining chip against the United States and other world powers. North Korea has demonized the United States as the ultimate threat and has used state-funded propaganda to indoctrinate its people. North Korea’s government continually tells its people that the United States will invade at any minute and to be prepared for the worst. Propaganda has been used to create and enforce military, economic, and political policies for an ideology that supports the unification of all of Korea under Communist control. North Korea is mainly mountainous; there is little quality farmland. While only 2 percent of the land is in permanent crops, about a third of the population works in agriculture. The best farmland in North Korea is located south of the capital city of Pyongyang. The capital is a restricted area where only the most loyal to the state can live. There is a serious shortage of goods and services. Electricity is not available on a dependable basis. Massive international food aid has sustained the people of North Korea. Outside food aid is accepted even though Kim Jong Il has continued a policy of self-reliance and self-sufficiency called JuchePolicy of self-sufficiency and self-reliance in North Korea.. Juche is designed to keep Korea from becoming dependent on the outside. The policy of Juche has been quite effective in isolating the people of North Korea and keeping dictator Kim Jong Il in power. The policy of Juche also holds back the wave of corporate capitalism that seeks to exploit labor and resources in global markets for economic profit. A North Korean soldier looks across the DMZ in the Joint Security Area (left). The modern “63 Building” in Seoul, South Korea, stands as witness to the prosperity and advancements in the South Korean economy (right). Sources: Photo on left courtesy of Expert Infantry, http://www.flickr.com/photos/expertinfantry/5439135543. Photo on right courtesy of PhareannaH[berhabuk], http://www.flickr.com/photos/phareannah/2520374354. One way that North Koreans are finding out about the outside world is through smuggled-in cell phones and VHS videotapes from South Korea. Popular VHS productions include South Korean soap operas, because of the common heritage, language, and ethnicity. The North Korean government has attempted to crack down on smuggled videotapes by going from home to home. Electricity is turned off before entering the home. Once the electricity is turned off, videotapes cannot be removed from the video player. The government agents then recover the videotape. Citizens found with smuggled videotapes are punished with steep fines or imprisonment. Desperate North Koreans have escaped across the border into northern China, where thousands of refugees have sought out better opportunities for their future. It is ironic to think that Communist China, with historically few human rights, would be a place where people would seek refuge, but China’s economy is growing and North Korea’s economy is stagnant, which creates strong push-pull forces on migration. In 1993, South Korea became a fully fledged democracy with its first democratically elected president. Seoul is the capital city and is home to almost ten million people. Seoul is located just south of the Cease-Fire Line, also known as the DMZ, which is referred to in general terms as the thirty-eighth parallel, even though it does not follow it exactly. The United States has many military installations in this area. South Korea manufactures automobiles, electronic goods, and textiles that are sold around the world. South Korea is a democracy that has used state capitalismWhen the state owns or controls the means of production but allows the free markets to determine supply and demand. to develop its economy. After the World War II era, South Korea was ruled by a military government that implemented land reform and received external economic aid. Large agricultural estates were broken up and redistributed to the people. Agricultural production increased to meet the demands of the population. South Korea has much more agricultural production than North Korea and is therefore in providing food for the high population density. A once-modest manufacturing sector has grown to become a major production center for export trade. The fifty million people who live in South Korea have a much higher standard of living than the residents of North Korea. Personal income in the north is barely equivalent to a few dollars per day, while personal income in the south is similar to that of Western countries. The economic growth of the south was a result of state-controlled capitalism, rather than free-enterprise capitalism. The state has controlled or owned most of the industrial operations and sold its products in the global marketplace. Giant corporations, which forced industrialization along the coastal region, have promoted South Korea as the world’s leading shipbuilding nation. South Korean corporations include Daewoo, Samsung, Kia Motors, Hyundai, and the Orion Group. As an economic tiger, South Korea continues to reform its economic system to adapt to global economic conditions. South Korea has announced plans to conduct a comprehensive overhaul of its energy and transportation networks. Government funding will augment efforts to create more green-based initiatives. Part of this effort will focus on lower energy dependency with environmentally friendly energy developments such as wind, solar, bike lanes, and new lighting technologies. High-speed rail service and increased capacity in electronic transmissions lines are planned as part of a next generation of energy-efficient technologies that will increase economic efficiency. These policies have been enacted to update South Korea’s economy and create new products for manufacturing export. Buddhism was introduced into the Korean Peninsula, as were many other aspects of Chinese culture that had significant effects on the Korean heritage. 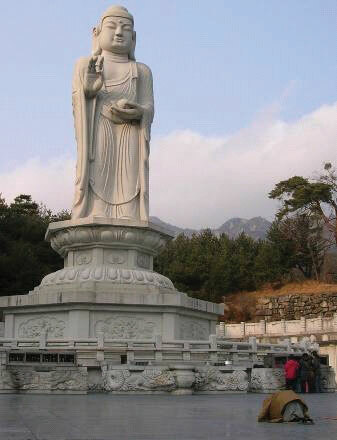 Buddhism has been a prominent religion in Korea for centuries. The teachings of Confucius are also widely regarded. About 30 percent of the population claims Christianity as their religious background; about 20 percent of the Christians are Protestant and 10 percent are Catholic. This is the highest Christian percentage of any Asian country. Up to half of the population makes no claims or professions of faith in any organized religion. Before 1948, Pyongyang was a notable Christian center. At that time, approximately three hundred thousand people identified as Christian. After the establishment of a Communist government in North Korea, many of the Christians fled to South Korea to avoid persecution. What if North Korea and South Korea would become unified again? In the field of geography, there is a concept of regional complementarityWhen two areas can exchange goods or resources to satisfy both sides’ demands and both can benefit., which exists when two separate regions possess qualities that would work to complement each if unified into one unit. North and South Korea are the classic illustration of regional complementarity. The North is mountainous and has access to minerals, coal, iron ore, and nitrates (fertilizers) that are needed in the South for industrialization and food production. The South has the most farmland and can produce large harvests of rice and other food crops. The South has industrial technology and capital needed for development in the North. If and when these two countries are reunited, they could work well as an economic unit. Source: Photo used by permission of Jane Elizabeth Keeler. The harder question is how and under what circumstances the two Koreas could ever come to terms of unification. What about the thirty-five to forty thousand US soldiers along the DMZ? What type of government would the unified Korea have? There are many young people in South Korea that would like to see the US military leave Korea and the two sides united. The generation of soldiers that survived the Korean War in the 1950s understands the bitterness and difficulties caused by the division. This segment of the population is highly supportive of maintaining the presence of the US military on the border with North Korea. Unification is not likely to take place until this generation either passes away or comes to terms with unification. The brutal dictatorship of Kim Jong Il, with his claimed nuclear capabilities, has been a main barrier to unification. This is a political division, not technically a cultural division, even though the societies are quite different at the present time. The geography of this situation is similar to that of East and West Germany after World War II and during the Cold War. Korea may have different qualities from Germany, but unification may be possible under certain conditions, foremost being different leadership in the north. Japan’s mountainous archipelago has provided isolation and protection for the Japanese people to maintain their unique culture and heritage. The islands were created by tectonic plate action, which continues to cause earthquakes in the region. Japan was a colonial power that colonized much of the Asian Pacific region. Its defeat in World War II devastated the country and liberated all its colonies. Since 1945, Japan has been developing one of the strongest economies in the world through manufacturing. Japan is a highly industrialized country that is in stage 5 of the index of economic development. The country’s small family size and declining population are a concern for economic growth in the future. The Korean Peninsula is divided in two by the DMZ. North Korea is a Communist dictatorship with a low standard of living and absolutely no civil rights. South Korea is a capitalist democracy with a high standard of living and a free-market economy. North Korea is more mountainous and lacks arable land to grow food. South Korea has more farmland and fewer mountains. If the two countries were to be united with a common economy, they would complement each other with a balance of natural resources. What climate types are found in Japan? How does climate type correspond to population? Why has Japan never experienced a strong rural-to-urban shift in its population? What is the ethnic makeup of Japan? Why does this pattern exist in Japan? Does Japan have a high or low population growth rate? What problems arise from this situation? How did Japan become an economic superpower after 1945? How would South Korean soap operas pose a serious threat to North Korea? How did South Korea develop such a robust economy with such a small physical area? Why are thousands of US soldiers positioned on the DMZ? How does North Korea’s policy of juche align with the global economy? Explain how the concept of regional complementarity applies to the two Koreas.